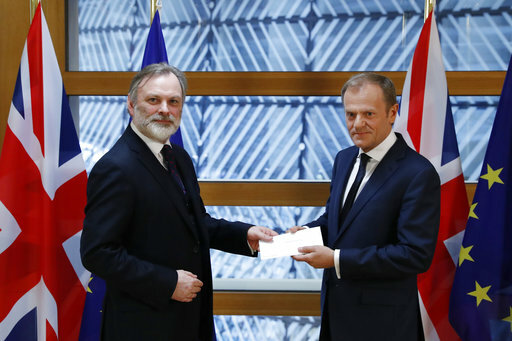 LONDON (AP) — The United Kingdom filed for divorce from the European Union on Wednesday, overturning four decades of integration with its neighbors, demolishing the notion that EU expansion is inevitable and shaking the foundations of a bloc that is facing challenges to its identity and its place in the world. It is even more tumultuous for Britain. For all the U.K. government’s confident talk of forging a close and friendly new relationship with its neighbors, it cannot be sure what it’s future relationship with the bloc will look like — whether businesses will freely be able to trade, students to study abroad or pensioners to retire with ease in other EU states. Those things have become part of life since the U.K. joined what was then called the European Economic Community in 1973.